Standard - $89.99 X-Large - $89.99 Only 4 left! The journey to mastering the Dark Side can be a long and often painful one. Darth Vader had to leave his old life as a Jedi behind and fully embrace the teachings of Emperor Palpatine. Kylo Ren had to forsake his family and destroy everything he once believed in. You? 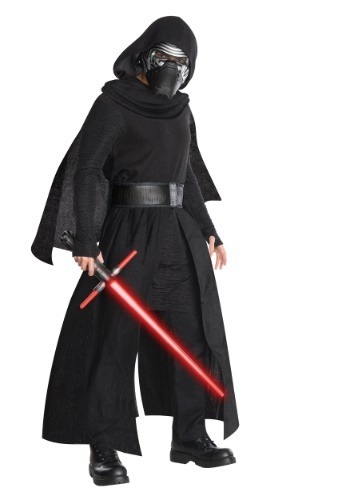 Well, for you, there’s a much easier way if you’re willing to accept it… this Super Deluxe Kylo Ren costume, which is a high quality outfit that’s fully licensed from Star Wars: The Force Awakens. Okay, okay. We know what you’re thinking. You can’t just put on a high quality Star Wars costume to become a master of the Dark Side, even if it IS highly detailed and modeled after the one worn by Adam Driver from The Force Awakens. But do you really want to forsake your family and friends just so you can swing around a red lightsaber and get a cool outfit? This Kylo Ren costume comes with multiple pieces, like a tunic, cape and mask that all help to recreate the iconic look from the movie. You don’t have to pledge allegiance to that creepy Supreme Leader Snoke, you don’t have to chase after various members of the Resistance and you don’t even have to hunt down Luke Skywalker. You just have to wear this costume and glare menacingly at your enemies. That seems like a much better deal than having to talk to Snoke or Darth Sidious all the time.